Depending on when you’re reading this, the Secret Santa slot will be met with hordes of excitement or groans of antipathy. However, some of us love Christmas all year round! If you’re an eternal Buddy-the-Elf, then you’ll love this Microgaming slot. It takes place in the middle of a winter paradise, while Old Saint Nick is doing his best to deliver cool presents to all of the lucky kids who made the nice list. The background of the reels is a view that we imagine Santa is very familiar with, it’s an aerial view of some quaint looking snow-topped houses. The reels themselves are a very festive deep red. There are 1024 ways to win in the Secret Santa slot, which could be considered a Christmas gift in itself! There are five row and three reels, with possible bets ranging from 50p-£5. We’ll admit, it’s not the largest betting range that we’ve ever seen. However, it has plenty of bonus features to make up for it. On the slot’s reels, the typical playing card symbols have been given a twist. Instead of the conventional values, you’ll see colourful suit emblems. The club, spade, heart and diamond have all been made to look like gems. The other symbols in this slot game are all scenes straight out of a department store Christmas advert. They include the Christmas tree, the present, fireplace, Christmas pudding and of course, Santa Claus. There are two bonus symbols in the slot game. The first is the wild, which is covered by the slot’s logo. It functions like a standard wild, whereby it can replace all other symbols except the scatter. The scatter symbol for this game is the Christmas cracker. It will pay out in any position. Unlike most other slots, there is no bonus symbol required to trigger any of the Secret Santa Bonus games. Santa is one generous fellow! At any point in Secret Santa slot, you could see a large present appear on the reels. The present will be opened to reveal your prize, which could be the addition of wild reels, a wild boost, a scatter spree, a mystery multiplier, rolling reels, dashing wild or five free spins. Each option can boost your payout significantly. The Secret Santa slot includes a cool five of a kind feature that pays out when a winning combination of five symbols is landed. Unfortunately, the five of a kind combo can’t include the wild or the scatter. Landing this combo will generate a payout and the symbols will also turn into another matching set of symbols. Two wins in quick succession! That’s what we call a Merry Christmas! 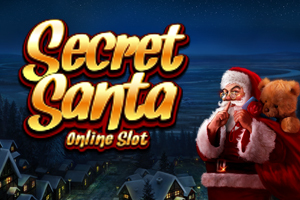 Other exciting Christmas themed slot games Secrets or Christmas and Santas Wild Ride why not check them out?